Graduate college, get married, buy a house, have kids, retire and die. That's the American dream, right? For some people, sure. But it's also quite presumptuous to think that in a country this vast with this many people, all people would want the same things. As America has gotten older, with each generation, more and more citizens are exploring other possibilities. 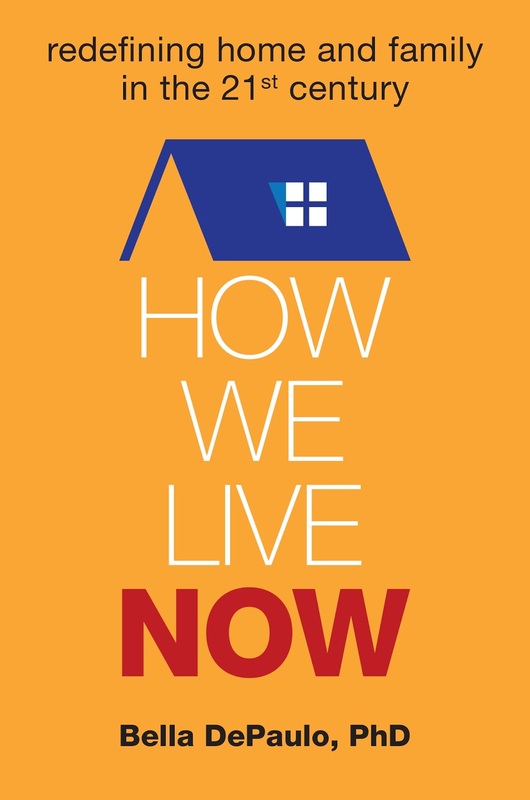 Author and social psychologist Bella DePaulo has a new book out, How We Live Now, about the variety of ways everyone else is living. In the chapter on single parents, you'll find a few pages about our family. I'm thrilled and honored to be a part of it, just as it was a thrill and honor to be interviewed by the warm and smart Bella DePaulo herself! DePaulo's skilled writing brings all of these people and their stories to life. I was particularly intrigued to read about those who have created intentional communities, as it remains my dream to build a community for single parent families. But I confess, I had a hard time picturing my own family in such a community. As I said in the interview with Bella, we are quite happy with our lives as we live them now. We came about this less intentionally than others profiled in How We Live Now, but sometimes, you find that making the best of a situation really is the best situation for you. Or us, at least. I've tried (a couple of times now) to fit the mold of one who wants the American dream, but it just never felt right. Not long ago, I came across some papers written in a former life (when I was a teenager) about my dream life. Even in my yearbook, I predicted a 2nd divorce. Okay, so the fantasy about a Flashdance-style warehouse apartment was not all that original, but it was just the backdrop for the ultimate fantasy of my own space. And by that, I don't even mean owning it. Not that anyone dreams about mortgages, but I also don't recall wanting to claim property as "all mine!" Rent, for me, has just meant the price one pays for the benefit of a roof over your head. I never wanted to fix the roof itself. DePaulo's book tells many stories of many others with their own dreams of 'happily ever after' that don't bear much resemblance to the fairy tales. Not that everyone is single. There are plenty of couples and even families, but they've chosen different life spaces than the picket fence in the suburban neighborhood. There's also a chapter on senior living, featuring many who did live the nuclear family lifestyle, but now have chosen other ways or places to call home. I don't find the book to be preachy or in any way trying to sell readers on one way of living. It's not even dismissive of the more traditional nuclear family choice. What the book does is open the doors to many homes that are merely different than what we normally see in movies or on TV. The readers are welcomed to explore new ways of thinking. The only "lesson" is to be intentional and think about what's best for you and your loved ones. As for our family, we will continue to enjoy our abode for now. I think changes may be coming soon, and if and when they do, we'll figure out how to make those changes feel like the best situation for us at that moment. Visit Bella's page to learn more about the book - or just go buy it on Amazon. And oh yeah, my book is also available on Amazon!